This petition has been created by International Human Rights C. and may not represent the views of the Avaaz community. In total 5,595 people have signed our petition. On the day when Palestinian minor Ahed Tamimi was released from an Israeli prison, we demand the immediate release of all child prisoners in Israeli jails, and ending the Israeli policy of detaining, interrogating and torturing Palestinian children. 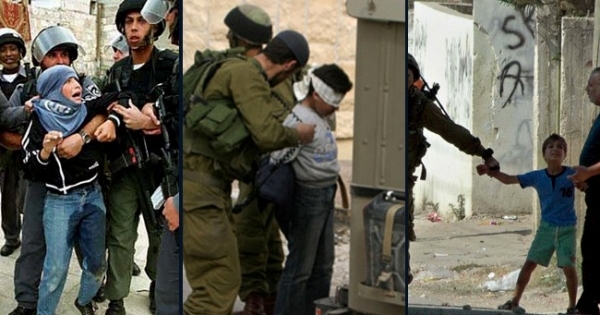 Israel’s systematic violations of international law in its treatment of Palestinian children has been well documented by UNICEF’s 2013 Children in Israeli Military Detention report, UNICEF’s subsequent progress reports of Oct. 2013 and Feb. 2015, the Feb. 2014 Australian film Stone Cold Justice, and by other international organisations such as Human Rights Watch and Defence for Children International. Child detention, abuse and torture constitute a violation of Israel's legal obligations under the Convention against Torture and Other Cruel, Inhuman or Degrading Treatment or Punishment, the Convention on the Rights of the Child, the International Covenant on Civil and Political Rights and the Fourth Geneva Convention. According to the April 2016 report No Way to Treat a Child by Defence for Children International – Palestine, between 500‐700 children are prosecuted in Israeli military courts every year, 75% of these children report assault during detention, 97% of interrogations are held without the presence of a parent or a lawyer, and by the date of the report’s publication 440 children were held in military detention. The Israeli human rights organisation B’Tselem has reported that the number of Palestinian minors in Israeli jails remained above 300 by the end of 2016. Palestinian children held in Israeli jails and detention centres suffer from harsh and inhumane conditions of detention, including lack of food and clothing, lack of hygiene, detention in rooms where there is no ventilation and lighting, no access to medical care, lack of playgrounds, denial of family visits, no access to counsellors and psychologists, detention with Israeli criminal children, verbal abuse and beatings, sexual harassment, collective punishment and disease outbreaks. This campaign was launched by the International Human Rights Centre (IHRC) to collect the signatures of all people of conscious around the world to pressure the Israeli authorities to release all child prisoners in Israeli jails, end Israel’s cruel and inhuman treatment of Palestinian children, and to send a message of a reminder to the international community of the on‐going plight of the Palestinian people. IHRC is a non-profit organisation that is registered in England and Wales to advance the human rights of all subjugated individuals and communities around the world. For more information, please visit our website: www.inthumanrightscentre.co.uk.